108 pages, full color, print . . . What’s Inside . . . 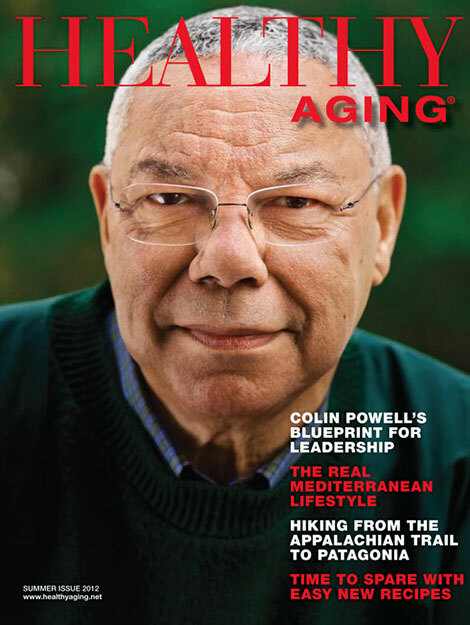 Feature article on Colin Powell, what it takes to be a leader. Review and excerpt from Colin Powell’s book, It Worked for Me. AFFORDING HIGHER EDUCATION ON A BABY BOOMER BUDGET. Are you financially ready for sending your kids to college? Celebrate the outdoors and hiking. Hear from hikers on why they do what they do. A SALUTE TO THE SUMMER OLYMPICS. Never too old to be an Olympian. Passing down family history without computers or emails. Tips for older job hunters. IS A PERSONAL SHOPPER FOR YOU? Have you ever wondered what the personal shopper experience is all about? Inside look into the shopping service. A FAMILY FARM IN TUSCANY. Generations come together to keep the family farm alive and bring it to the next level. Feature and travel destination idea. Recipes for easy entertaining from some of the latest cookbook authors and trendiest chefs. TIPS FOR GETTING BETTER SLEEP. Are you a night owl but would prefer a good night’s sleep? How one man changed his life mid-stream and follows his passion while giving back.